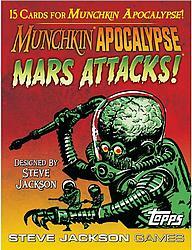 Mars Attacks!, the hit trading card series from Topps, is invading the world of Munchkin Apocalypse! In this 15-card booster, you'll battle Monster Bugs and the Heat Ray Saucer on your way to Level 10, with the help of new goodies like the Martian Zap Rifle and Giant Spiky Feet. But watch out for the new Seals – you could end the world with Reality TV!